Sales of passenger vehicles (cars, vans and utility vehicles) in the domestic market remained in the growth lane in May. Helped by double-digit growth at Maruti Suzuki, Honda and Tata Motors. After 14.7 per cent growth in April, first month of financial year 2017-18, sales in May are estimated to have grown around nine per cent, in spite of the possibility of a price cut in some segment of cars from July 1, when the national goods and services tax (GST) takes effect. 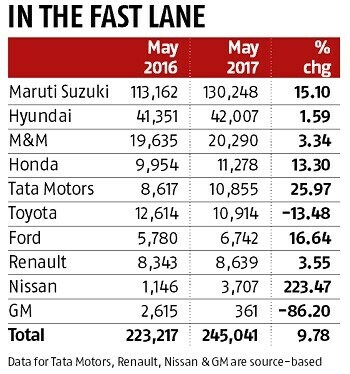 Maruti Suzuki, the biggest in car sales, reported a 15.1 per cent jump in domestic sales of passenger vehicles (cars, utility vehicles and vans) in May. It sold 130,248 units in the domestic market against 113,162 units in the same month last year. Most product segments at Maruti reported strong growth. The utility vehicle segment jumped 66 per cent to 22,608 units; the mini segment (Alto and WagonR) grew 18 per cent to 39,089 vehicles. The compact segment (Baleno, Ignis, Dzire, etc) saw an increase of 10 per cent to 51,234 units. The company's stock hit a new high of Rs 7,249 at the BSE early on Thursday but closed at Rs 7,143, down almost one per cent from Wednesday. Korea's Hyundai did not announce the numbers on Thursday. However, it is estimated to have sold 41,500 vehicles in the domestic market last month, growing marginally from the 41,351 in May last year. Utility vehicle major Mahindra & Mahindra saw a three per cent increase in sales last month to 20,290 units. Rajan Wadhera, its president (automotive), said they had a robust outlook, given the favourable monsoon projection and the government's focused investment in the rural sector. Honda Cars said its May sales grew a little more than 13 per cent to 11,278 units, owing to the demand for the new City and WR-V.
Japan's Toyota reported a decline of 13 per cent vis-a-vis May last year. N Raja, director and senior vice-president (sales & marketing) pointed to two factors. "Last year was the first month of the Crysta launch and we had dispatched large volumes. So, there is a base effect. Second, many customers have decided to delay, so that they get the benefit of GST-led reduction," he said. He added that June's volume might also see an impact but sales could pick up from July. Nissan is learnt to have seen a sharp growth of 223 per cent to 3,707 units, compared to May 2016, a low base month. Its alliance partner, Renault, also did not report May sales but is understood to have seen growth of three per cent to 8,639 units. 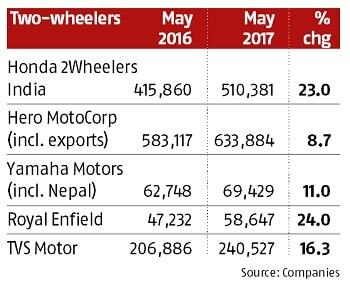 General Motors, which announced its decision to exit the domestic market last month, is learnt to have dispatched only 361 vehicles to dealers in May, down 86 per cent from the corresponding month last year.